The leaders of Ethiopia, Somalia and Eritrea, Prime Minister Abiy Ahmed, President Mohammed Abdullahi Mahmud Farmajo and President Isaias Afwerki held a series of consultations in Bahr Dar, Ethiopia on November 9-10, 2018. The three sides stressed that this, their second meeting in as many months highlights the historic transformation towards peace and integration in the horn of Africa. In their consultation, the three leaders reviewed developments and achievements since the signing in Asmara of the joint declaration on friendship and comprehensive cooperation between the three countries. They noted with satisfaction the tangible and positive outcomes already registered, and agreed to consolidate their mutual solidarity and support in addressing challenges that they face individually and collectively. In this regards they stressed the importance of respecting the sovereignty, territorial integrity and political independence of Somalia as well as their firm support for the Somali people and the Federal Government of Somalia and all its institutions. They also commended them for the progress they are making towards peace and stability. The leaders of Ethiopia, Somalia and Eritrea welcomed the impending lifting of all sanctions against Eritrea and underscored their conviction that this act of justice would contribute to enhancing peace, development and cooperation in the region. They also reaffirmed their commitment to an inclusive regional peace and cooperation. 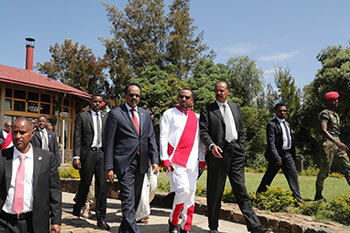 The president of Eritrea and Somalia expressed their profound appreciation to Prime Minister Abiy and the people and government of Ethiopia for the warm reception an hospitality accorded to them and their delegations in the historic city of Gondar and the beautiful city of Bahr Dar, a reception that reflected the close and historic ties between the three nations.